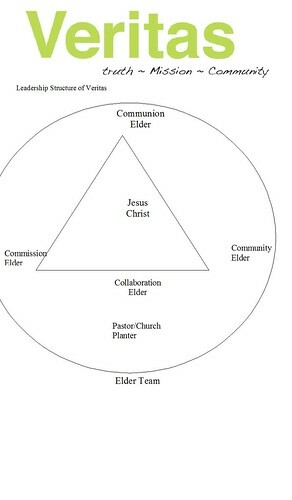 Over the last few months at Veritas we have been sharing the diagram that is above during our worship gathering time. We had started just with sharing stories of how we had been a blessing in the world, how we had lived out the kingdom in word and deed in the past week, and where God was leading us to live missionary lives. Then I realized we needed more than just the stories of being missional, and then I added how we were growing in our Christian journey. We shared stories of what God was teaching us through our times of individual and corporate prayer, worship, bible study, life in the world, and experiencing God in places where we didn’t expect him to be. Not too long after starting these discussions during our worship gathering I saw this triangle in material put out by 3DM called Lifeshapes. The idea is that “we are created to be three-dimensional beings; when one dimension is missing or suppressed, the other two do not work as they should. If we do not have all three elements of the Triangle- the Up, the In, and the Out- we are out of balance and we will wobble through life.” (Taken from “Building a Discipling Culture” by Mike Breen and Steve Cockram) I realized that we were sharing stories and instances of living OUT, and UP lives, but were neglecting the IN part. So we began taking 10-15 minutes each worship gathering to hear and tell stories of our UP, IN, and OUT lives. As I have been looking at the triangle, I have also realized that it fits our 3 Core Values very well..Safe, Spiritual Search (IN), Missional Kingdom Life (OUT), and Authentic Worship Expression (UP). I also began to wonder what it would look like if not only individuals lived out the OUT, UP, IN in their lives, but what it would look like for a community to live this out together in a corporate fashion. So for the past month to a month and a half we have been living out as a community this rhythm taken from the triangle. 1st Sunday of the month is our OUT Sunday. We take our time that Sunday to serve the community of Lancaster in some way as well as missionally engage with people. Last week we were asked by Occupy Lancaster to lead a Bible Study. Since this is really new to us, I am waiting to see how we grow, develop, and live out the mission God has called us to by using this missional rhythm of OUT, UP, and IN. I would love to hear your thoughts, comments, ideas, suggestions, and questions about our Monthly Rhythm.